This adapter helps to keep your system running at peak performance. Unlike USB external video solutions, Thunderbolt 3 lets you run Ultra HD 4K resolution at 30Hz on both displays without draining system resources. 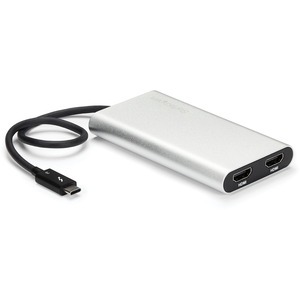 Because it's backward compatible with your high-definition 1080p displays, this is a great accessory for home, office or other desktop workspace applications. The TB32HD2 is backed by a 2-year StarTech.com warranty and free lifetime technical support.